Scarlet skin, shades to white at base. Heirloom. Oblong roots grow 1 3/4" long and 3/4" wide. Scarlet skin, shades to white at base. White flesh is crisp and mildly pungent when young. Fast and easy to grow, radishes are best in cool weather and planted in a sunny location. Certified Organic Seed. Radishes are one of the quickest and tastiest crops to grow in early spring and again in fall. See how easy it is to grow in your garden. Sow radish seeds in well-worked soil after danger of frost in early spring, again in late summer for fall crop. In frost free areas, sow in the fall. Sow thinly in rows about 6" apart. Cover with 1/2" of fine soil; firm lightly and keep evenly moist. Seedlings emerge in 4-6 days. Thin to stand about 2" apart. 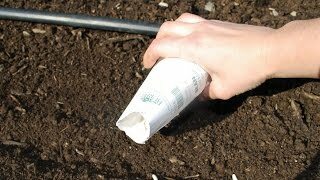 Sow winter radishes in midsummer for late fall and winter use. They can grow large with several inches of root showing above ground. Water continuously and evenly. Avoid over-fertilizing radish plants. Pull spring radishes when they are the proper size for the type, about 25 days after planting. If you wait too long to harvest they will become pithy. Push back the soil to see if they have formed bulbs, and taste one or two to see if they are ready. Finish harvest before warm weather comes. Cut off the tops and store in plastic bags at 32-40 degrees F, in the refrigerator, for up to 3 weeks. 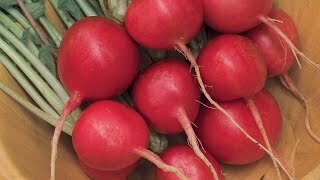 Harvest winter or fall radishes as needed in fall. Dig all remaining roots before the ground freezes and store throughout the winter (use as needed). Radishes may be eaten raw in salads or sautéed in butter with salt, pepper and herbs as a side dish. Winter radishes may be cooked like turnips or used in stir fry. They may also be pickled. Radish, French Breakfast Organic is rated 5.0 out of 5 by 3. Rated 5 out of 5 by KellyFL from Beautiful and Delicious These are very easy and consistent, high germination rate. I sow every 2 weeks. Rated 5 out of 5 by Joyg from Great on all counts. I have planted a row of these little beauties every 10 days since I bought them. I think it must be 100% germination because they all seemed to grow. We have had these tender, crunchy radishes every day for the past 2 months, and have more rows getting ready for October.